Aim: The purpose of this study was to evaluate the effect of multiple root canal usage on the surface topography and fracture of Twisted File (TF) and ProTaper (PT) rotary Ni-Ti file systems, using scanning electron microscope (SEM). Materials and Methods: Ten sets of PT and TF instruments were used to prepare the mesial canals of mandibular first molars. TF 25, 0.06 taper and PT F1 instruments were analyzed by SEM when new and thereafter every three root canal usages. This sequence was repeated for both the TF and PT groups until 12 uses. Two images of the instrument were recorded, one of the instrument tip and the other 5 mm from the tip, both at ×100 magnification. The sequential use was continued till the instrument fractured and the number of root canal usages for the file to fracture was noted. All fracture surfaces were examined under the SEM. Results: Fresh TF instruments showed no surface wear when compared to PT instruments (P < 0.05). Spiral distortion scores remained the same for both the groups till the 6 th usage (P > 0.05), while at the 9 th usage TF showed a steep increase in the spiral distortion score when compared to PT (P < 0.05). PT instruments fractured at a mean root canal usage of 17.4, while TF instruments showed a mean root canal usage of 11.8. Fractographically, all the TF instruments failed due to torsion, while all the PT instruments failed because of cyclic fatigue. Conclusion: PT instruments showed more resistance to fracture than TF instruments. Previous studies have independently evaluated torsional and cyclic fracture of TF to that of other Ni-Ti file systems that are manufactured by the grinding process. ,,,, These, however, were performed in an in vitro condition using resin or metal molds. On the contrary, rotary instruments are subjected to varying loads in real clinical situations and instrument failure is a multifactorial problem. Number of usages of an endodontic instrument may be an important factor controlling instrument failure, which in turn is directly related to pre-existing surface defects and to those generated during canal instrumentation. , Moreover, topographic features control the adhesion on material's surface of biological components, serving as potential sites for microorganisms, blood cells, and tissues debris. Hence, it is important to understand the nature, type, and incidence of these surface defects of Ni-Ti instruments. So far, there has been no study that evaluates the deformation and fracture of TF instruments during/after multiple root canal usage. The purpose of this study was to evaluate the effect of multiple canal usages in extracted teeth on the surface topography and fracture of TF in comparison to ProTaper (PT) (Dentsply Maillefer, Ballaigues, Switzerland), which is a commonly used rotary Ni-Ti file system manufactured by grinding process using scanning electron microscope (SEM). Two hundred freshly extracted human mandibular first molars, the apices of which were fully formed, were used in the study. Direct and angled radiographs of each tooth were obtained using a paralleling technique to evaluate root canal anatomy. The canal radius and angle of curvature were standardized between 3 and 5 mm and between 30° and 40°, respectively, as defined by Pruett et al. The teeth were sectioned at the cemento-enamel junction by a separating disk. Canals were located using a DG-16 endodontic explorer (Hu-Friedy, Chicago, IL, USA). The patency of the coronal third of the canal was verified with an ISO #15 K-file (Mani, Inc., Tochigi, Japan) and coronal enlargement was done with the orifice shapers of the respective file systems. For working length (WL) determination, an ISO #8 K-file (Mani, Inc.) was used to negotiate the length of the canal. The tip of the file was then visualized externally at the apical foramen under ×5 magnification (Seiler Revelation, St. Louis, MO, USA). This length was recorded, and the final WL was established at 1 mm short of this recorded length. The coronal end of the root was further restricted such that the WL of all canals was standardized to 13 mm. Following coronal enlargement and standardization of WL, in order to allow for assessment of the apical diameter of the canal, an ISO #10 K-file was extended upto the WL. If it failed to bind at the predetermined WL, the canal was excluded from the study. The canals were instrumented to ISO #15 stainless steel hand files in a filing motion. Only mesial canals of mandibular first molars were used for instrumentation. The study evaluated 10 files each in both the TF and PT rotary file systems, numbered from 1 to 10. In the TF system, file 25, 0.06 taper was chosen for assessing, while in PT system, file F1 was chosen. Instruments of the two systems were initially scrubbed and later immersed in 1% sodium hypochlorite for 10 min, followed by ultrasonic cleaning (Codyson, Shenzhen Codyson Electrical Co., Ltd, Guangdong, China) for 5 min. The instruments were then stored in metal boxes identified with the group and the specimen number, and placed in envelopes for sterilization. They were processed in an autoclave and sterilized by exposure to humid heat with a pressure of 15 psi, for 15 min and 127°C (Life Steriware, New Delhi, India). The instruments were mounted in a metal jig which enabled the instrument to maintain the same direction of orientation at each examination. Two observers analyzed 9-10 mm of the tip of the instrument and 180° of its circumference at ×100 magnification to investigate deformation in the body of the instrument. Two images of the instrument were recorded, one at the instrument tip and the other at 5 mm from the tip, both at × 100 magnification using SEM (Hitachi, S-3400N, High Technologies Co, Tokyo, Japan). This distance was measured using the software in the SEM, with an accuracy of 0.1 mm. Following SEM evaluation, the files were used to shape the pre-standardized mesial root canals. The cleaning and shaping of the canals were completed in accordance with the technique recommended by the manufacturers. All the 20 sets (TF and PT) of instruments were used by the same operator. An endodontic electric motor (X-SMART™ , Dentsply Maillefer), operating with a torque of 5 N cm with a hand piece of 16:1 reduction, was used for instrumentation. Light pressure during the instrumentation procedure was used together with back and forth movements of an amplitude of between 2 and 3 mm. The usage time for each instrument was kept between 2 and 3 seconds. Irrigation was performed by using alternating solutions of 2.5% sodium hypochlorite solution and 17% ethylenediaminetetraacetic acid. All instruments were analyzed using SEM after every third usage upto 12 usages. Even if the instrument had some deformation identified under SEM, its use was continued and was not discarded. A file was discarded only when it fractured during preparation. The files that did not fracture by the 12 th usage were sequentially used in the standardized root canal till the instrument fractured and the number of usages for the file to fracture was noted. The fractured instrument segments were further cleaned ultrasonically and mounted on the microscope stage, with the fracture end facing upward, for fractographic examination. The mode of fracture was classified as "fatigue" or "shear," as described by Cheung et al. All the electron micrographs of each of the 20 instruments analyzed were coded and stored digitally for analysis. 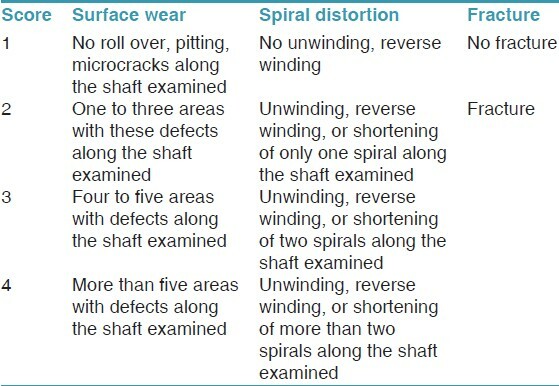 Three observers scored each file for surface wear, distortion of the instrument's spirals, and instrument fracture using the scoring criteria described in [Table 1]. After scoring the photomicrographs, the information was recorded and analyzed using Mann-Whitney U-tests. Data were analyzed using the SPSS 17.0 software (V.17.0; SPSS, Chicago, IL, USA). The level of significance was set at P < 0.05. At zero root canal usage, TF had no surface wear when compared to PT. This difference was statistically significant (P < 0.05). TF progressively deteriorated and was significantly poor when compared to PT at the end of 9 th usage (P < 0.05) [Table 2]. Spiral distortion was not observed in the tested PT instruments till the 9 th usage, while TF showed spiral distortion at the 6 th usage. There was no statistical significance difference between the groups till the 3 rd root canal usage (P > 0.05), while at the 6 th usage TF showed a higher spiral distortion score when compared to PT (P < 0.05). At the 9 th usage, TF showed a statistically significant steep increase in the spiral distortion score when compared to PT (P < 0.05) [Table 3]. PT instruments fractured between the 16 th and 21 st root canal usages, with a mean root canal usage of 17.4. TF instruments fractured between the 9 th and 12 th root canal usage, with a mean root canal usage of 11.8. This difference was statistically significant (P < 0.005). [Figure 1] and [Figure 2] are examples of instruments from both systems at 0, 1 st , 3 rd , 6 th , 9 th , and 12 th canal usages. Fractographically, all TF instruments showed the typical pattern of shear (torsional) fracture characterized by circular abrasion marks and skewed dimples near the center of rotation [Figure 3]a and b. The entire PT instruments showed fatigue striations and were classified as fatigue fracture [Figure 3]c and d.
Size 25, 0.06 taper TF and PT F1 (tip size #20 with 7% taper for the apical few millimeters) instruments were selected for the study as they possess the same diameter (0.55 mm) at D5 (i.e., 5 mm from the file tip). Furthermore, these instruments were used along the entire length of the root canal, and therefore undergo both torsional and flexural loads. The length of the fractured file segment could provide vital information to clinicians for evaluation of the most fragile portion of the instrument. However, a comparison of the length of the fractured segments of the instruments was not done as the pattern of fracture would influence this length. For instance, in the TF group, severe unwinding or reverse winding was noted which would affect the linear dimensions of the fractured segments. On initial observation under SEM (×100), various types of manufacturing defects were observed along the faces of the flutes or at the tips in the PT instruments, while the TF files were free of such defects. Wrinkle-like grooves running parallel to the long axis of the file were observed in the TF [Figure 1]a and b. Additionally, as the number of canal usages increased, chipping of cutting edges was noted on TF [Figure 1]e and f, as opposed to the PT with many crack lines that coincided with the machining grooves [Figure 2]e and f. The surface microcracks were found along and often associated with the machining grooves [Figure 2]f. These grooves are expected to be sites of stress concentration, hence potentially of crack initiation. Once a microcrack is initiated, dentin debris may be lodged within. Although TF showed fewer manufacturing defects on the flute surface or tip area compared with PT, it did not demonstrate superior resistance in fracture compared to PT, which was manufactured by conventional grinding method. Out of the 10 tested PT files, only one file showed visible deformation in the form of spiral distortion after the 12 th canal usage. Thus, there was little warning sign (i.e. unwinding) before a PT file might separate in use. This observation has also been agreed by a few authors. , On the contrary, all the tested TF instruments showed warning signs in the form of spiral distortion between the 6 th and 9 th canal usages [Figure 1]c and d. Moreover, fractographic analysis showed that all the tested TF instruments failed because of torsion [Figure 3]a and b. In contrast, the entire tested PT failed because of fatigue [Figure 3]c and d. Shen et al. reported similar observations of the PT files wherein none of PT files failed by torsion except for the S1 instrument. Thus, these findings would suggest that great care should be taken when using the PT system because unlike the TF, the warning signal (unscrewing of the flutes) may not occur at all. The mean root canal usage values to fracture for the tested PT and TF instruments were 17.4 and 11.8, respectively. Based on the scoring criteria for assessing surface topography and fracture used in the study, instruments with a score "3" would be more susceptible to fracture. Considering this, 30% of the PT files reached this surface wear score of 3 in the 9 th usage [Table 2], while its spiral distortion score did not reached this critical score even after 12 root canal usages [Table 3]. However, 10% of the TF reached this critical score for surface wear at the 6 th usage with 90% at the end of 9 th usage [Table 2]. Thus, the number of canal usages should be limited to six for TF and nine for PT to avoid unexpected failure of these instrument systems in teeth with a canal curvature ranging from 30° to 40°. TF showed a significantly higher resistance to cyclic fatigue than other Ni-Ti files that were manufactured using a grinding process. ,,, Although Gambarini et al. showed an increased torsional resistance with TF when compared to files manufactured by grinding process, TF presented the lowest torsional resistance in this study. This is in agreement with the finding of Yum et al.,  in which TF showed the least resistance to torsional fracture when compared to Ni-Ti files manufactured by machining. Despite the proposed advantage of the twisting process and a smooth surface finish, all the TF in this study failed by torsional fracture between the 9 th and 12 th canal usages. Few possible reasons for the inferior torsional strength of TF compared to PT have been discussed below. Instruments rotated at higher rotational speeds are more susceptible to distortion and fracture. The recommended revolution per minute (RPM) for PT and TF according to the manufacturer are 350 RPM and 500 RPM, respectively. Thus, use of TF at a higher speed could lead to more torsional fracture and its early fracture. Another possible explanation may be related to the thermomechanical manufacturing process. TF is made of an R-phase Ni-Ti alloy which shows good superelasticity with an elastic modulus lower than that of the austenitic phase. , Thus, an instrument made of the R-phase alloy would be more flexible, allowing a greater amount of deformation at a similar torque than austenitic Ni-Ti. When a torque is applied to the shank of the file, the stresses would be dissipated via the cutting edges (threads). From the morphometric examination, the number of threads for TF and PT were 9 and 12, respectively. Hence, a decrease in the pitch (more threads) could reduce the resolved shear stress at the clamped position. The TF, with a longer pitch than PT, might have resulted in a greater resolved stress, and hence a lower torsional resistance. The twisting process during manufacture induces residual stresses wherein the grain structure of the material is disturbed at a molecular level, making it unstable. This unstable grain structure would more likely to revert back to its original molecular level when favorable circumstances like torsion or shear forces act on it. Thus, various Ni-Ti rotary systems should be used according to the condition of the root canal in the clinical situation. Preparation of narrow and constricted canals could subject rotary instruments to higher torsional loads. Hence, Ni-Ti files with a high flexibility and good cyclic (flexural) fatigue resistance (e.g., TF) could be used for preparing curved canals, whereas those that are more resistant to torsional stresses (e.g., PT) should be used to prepare highly constricted and/or straight (or coronal portion of) root canals. 1. Walia H, Brantley WA, Gerstein H. An initial investigation of the bending and torsional properties of nitinol root canal files. J Endod 1988;14:346-51. 2. Garip Y, Gunday M. The use of computed tomography when comparing nickel titanium and stainless steel files during preparation of simulated curved canals. Int Endod J 2001;34:452-7. 3. Valois CR, Silva LP, Azevedo RB. Multiple autoclave cycles affect the surface of rotary nickel-titanium files: An atomic force microscopy study. J Endod 2008;34:859-62. 4. Barbakow F, Lutz F. The 'Lightspeed' preparation technique evaluated by Swiss clinicians after attending continuing education courses. Int Endod J 1997;30:46-50. 5. Thoden van Velzen SK, Duivenvoorden HJ, Schuurs AH. Probabilities of success and failure in endodontic treatment: A Bayesian approach. Oral Surg Oral Med Oral Pathol 1981;52:85-90. 6. Park SY, Cheung GS, Yum J, Hur B, Park JK, Kim HC. Dynamic torsional resistance of nickel-titanium rotary instruments. J Endod 2010;36:1200-4. 7. Spili P, Parashos P, Messer HH. The impact of instrument fracture on outcome of endodontic treatment. J Endod 2005;31:845-50. 8. Gambarini G, Pompa G, Di Carlo S, De Luca M, Testarelli L. An initial investigation on torsional properties of nickel-titanium instruments produced with a new manufacturing method. Aust Endod J 2009;35:70-2. 9. Tripi TR, Bonaccorso A, Condorelli GG. Cyclic fatigue of different nickel-titanium endodontic rotary instruments. Oral Surg Oral Med Oral Pathol Oral Radiol Endod 2006;102:e106-14. 10. Larsen CM, Watanabe I, Glickman GN, He J. Cyclic fatigue analysis of a new generation of nickel titanium rotary instruments. J Endod 2009;35:401-3. 11. Kim HC, Yum J, Hur B, Cheung GS. Cyclic fatigue and fracture characteristics of ground and twisted nickel-titanium rotary files. J Endod 2010;36:147-52. 12. Oh SR, Chang SW, Lee Y, Gu Y, Son WJ, Lee W, et al. A comparison of nickel titanium rotary instruments manufactured using different methods and cross-sectional areas: Ability to resist cyclic fatigue. Oral Surg Oral Med Oral Pathol Oral Radiol Endod 2010;109:622-8. 13. Blum JY, Machtou P, Micallef JP. Location of contact areas on rotary profile instruments in relationship to the forces developed during mechanical preparation on extracted teeth. Int Endod J 1999;32:108-14. 14. Tripi TR, Bonaccorso A, Tripi V, Condorelli GG, Rapisarda E. Defects in GT rotary instruments after use: An SEM study. J Endod 2001;27:782-5. 15. Alapati SB, Brantley WA, Svec TA, Powers JM, Nusstein JM, Daehn GS. 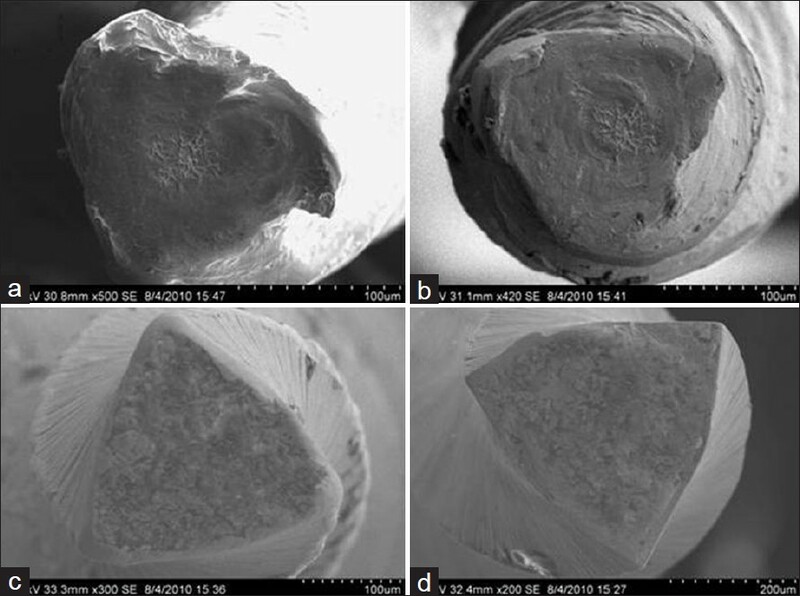 SEM observations of nickel-titanium rotary endodontic instruments that fractured during clinical use. J Endod 2005;31:40-3. 16. Pruett JP, Clement DJ, Carnes DL. Cyclic fatigue testing of nickel-titanium endodontic instruments. J Endod 1997;23:77-85. 17. Cheung GS, Peng B, Bian Z, Shen Y, Darvell BW. Defects in ProTaper S1 instruments after clinical use: Fractographic examination. Int Endod J 2005;38:802-9. 18. Yared GM, Bou Dagher FE, Machtou P. Cyclic fatigue of ProFile rotary instruments after clinical use. Int Endod J 2000;33:204-7. 19. Gambarini G. Cyclic fatigue of ProFile rotary instruments after prolonged clinical use. Int Endod J 2001;34:386-9. 20. Svec TA, Powers JM. The deterioration of rotary nickel-titanium files under controlled conditions. J Endod 2002;28:105-7. 21. Parashos P, Gordon I, Messer HH. Factors influencing defects of rotary nickel titanium endodontic instruments after clinical use. J Endod 2004;30:722-5. 22. Patiño PV, Biedma BM, Liébana CR, Cantatore G, Bahillo JG. The influence of a manual glide-path on the separation rate of NiTi rotary instruments. J Endod 2005;31:114-6. 23. Ankrum MT, Hartwell GR, Truitt JE. K3 Endo, ProTaper, and ProFile systems: Breakage and distortion in severely curved root of molars. J Endod 2004;30:234-7. 24. Spanaki-Voreadi AP, Kerezoudis NP, Zinelis S. Failure mechanism of ProTaper Ni-Ti rotary instruments during clinical use: Fractographic analysis. Int Endod J 2006;39:171-8. 25. Shen Y, Cheung GS, Bian Z, Peng B. Comparison of defects in pro file and pro taper systems after clinical use. J Endod 2006;32:61-5. 26. Gambarini G, Grande NM, Plotino G, Somma F, Garala M, De Luca M, et al. Fatigue resistance of engine-driven rotary nickel-titanium instruments produced by new manufacturing methods. J Endod 2008;34:1003-5. 27. Yum J. Torsional strength and toughness of Nickel-Titanium rotary files. J Endod 2011;37:382-6. 28. Zhang EW, Cheung GS, Zheng YF. Influence of cross-sectional design and dimension on mechanical behavior of nickel-titanium instruments under torsion and bending: A numerical analysis. J Endod 2010;36:1394-8. 29. Zelada G, Varela P, Martín B, Bahíllo JG, Magán F, Ahn S. The effect of rotational speed on the breakage of rotary endodontic instruments. J Endod 2002;28:540-2. 30. Miyai K, Ebihara A, Hayashi Y, Doi H, Suda H, Yoneyama T. Influence of phase transformation on the torsional and bending properties of nickel-titanium rotary endodontic instruments. Int Endod J 2006;39:119-26. 31. Liu Y, Van Humbeeck J, Stalmans R, Delaey L. Some aspects of the properties of NiTi shape memory alloy. J Alloys Compd 1997;247:115-21. 32. Walsch H. The hybrid concept of nickel-titanium rotary instrumentation. Dent Clin North Am 2004;48:183-202. 33. Peters OA, Peters CI, Schonenberger K, Barbakow F. ProTaper rotary root canal preparation: Assessment of torque and force in relation to canal anatomy. Int Endod J 2003;36:93-9.